Then the comedy legend couldn’t resist addressing the elephant in the room. Waves of laughter rippled through the full house of 1,845 in the Encore Theater at Wynn Las Vegas. Most knew Brooks was referencing to Steve Wynn, the Las Vegas gaming icon who’s reputation has been engulfed by alleged sexual misconduct. Brooks’ one-liner came amid the latest reports that Wynn’s former company continues to cut all ties with the 76-year-old casino developer. According to the Las Vegas Review-Journal he has vacated his 6,233-square foot villa at Wynn Las Vegas. He was given until June 1 to move out of his residency, when he paid $305,680 a year in rent. Wynn, who often enjoyed introducing his headliners, had talked Brooks into his making his Las Vegas debut. 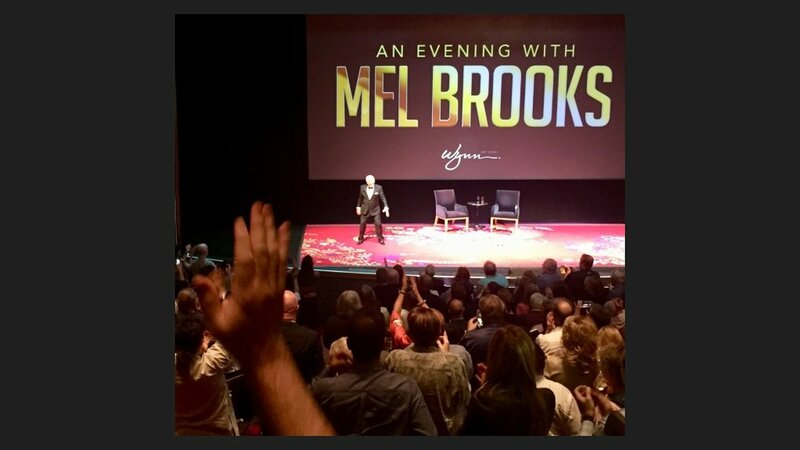 Brooks, who turns 92 in June, brought his A-game to his two-show engagement. He spent most of each night on the edge of the stage, sharing some of his favorite stories from a career that featured Oscar, Emmy, Grammy and Tony awards. One day in New York City, Brooks and his fellow comedy writers Larry Gelbart of “M.A.S.H.” fame and Neil Simon, who went on to Broadway fame, got together. “Gelbart and Simon were big friends of mine. They loved me and they used to follow me around because they knew I was crazy and funny and to see what adventure we’d get into. “One day we’re walking down 57th Street and three nuns come toward us. Larry said, ‘No, Mel, don’t do this’ and Neil said, ‘Mel, no, let it go.’"
“But I couldn’t help myself,” said Brooks. Brooks’ moderator, Kevin Salter, asked Brooks to go into details about his interest in having Dustin Hoffman in “The Producers,” which is celebrating its 50th anniversary this year. But days after giving Hoffman the role, Brooks was awakened by the sound of pebbles hitting his window. It was Hoffman, saying he had a crisis. He was invited to audition for “The Graduate” opposite Brooks’s wife, Anne Bancroft. Brooks saw no harm in allowing him to audition. Brooks said he thought, “Take you? Ha,ha! Short, stumpy.” Two days later Hoffman got the role as Benjamin and went on to receive an Oscar nomination for best actor. The role went to Gene Wilder, who went on to cinema stardom in “Willy Wonka and the Chocolate Factory” and “Young Frankenstein."